There's something comforting about this one pot meal of pork and mushrooms served with mashed potatoes. And though it is probably more of a winter dish I can't resist making it all year long. It's one of those easy weeknight dinners that goes from stove-top to table in about 30 minutes, takes minimal effort to put together and tastes amazing. In a medium bowl, whisk together water, red wine vinegar, balsamic vinegar and salt and pepper. Set aside. Working in batches, lay pork tenderloin slices on a large cutting board or work surface with a bit of space between them. Place a sheet of plastic wrap over them. Using the flat side of a meat mallet, pound the pork tenderloin slices to 1/4-inch thick. Mix the flour with salt and pepper and lightly flour the pork. In a large deep skillet or pot set over medium to medium-high heat, melt together olive oil and 1 tablespoon butter. Working in batches so as not to crowd the pan, cook pork slices for a couple of minutes on the first side, or until they start to brown. Flip meat and cook until the other side begins to turn brown as well. If necessary, add a bit more olive oil and butter to pot as you brown the meat. Remove cooked pork to a plate and set aside. Add 1 tablespoon of olive oil to the pan and add the garlic, cook for 1 minute. Deglaze the pan with the white wine until almost evaporated. Add mushrooms and the liquid mixture to the pan, bring to a boil. Reduce heat to a low simmer and cook for 10 to 15 minutes until reduced by half. Add pork back in for two more minutes. I love easy stove top meals in the summer! This seems like a great dish all year 'round! I love an easy meal on a busy weeknight! This looks like the perfect dinner! I love me some mashed potatoes! I am all about any comfort food that I can get on the table in 30 minutes. This certainly fits the bill. I'll bet that pork is fork tender. What an amazing dish! I need to make this. You have me at mushrooms and mashed potatoes! That with the pork just makes it the ultimate comfort dish! Oh man and that as a one pot meal is even better! Dinners that are made in less than 30 minutes are just perfect for us during the week! Pure comfort food right here! 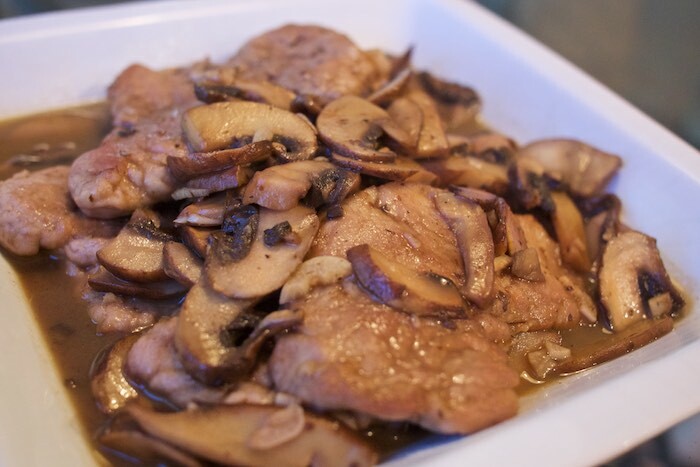 Love all those mushrooms on top of the pork and it belongs with mashed potatoes. Loving this delicious hearty meal! Thanks so much for stopping by #TryaBiteTuesday with your amazing recipes!! Tweeted & Pinned for later. See you next week! You can't beat a good meat and potatoes dish! A wonderful comfort food idea...especially served with luscious mashed potatoes!! Love these simple comfort food dishes - so good for everyone to have in their repertoire! This dish has my husbands name written all over it!